The Cedar Gathering Dining Set from Outdoor Furniture Plus gives you everything you need for stylish al fresco dining in one handsome package. 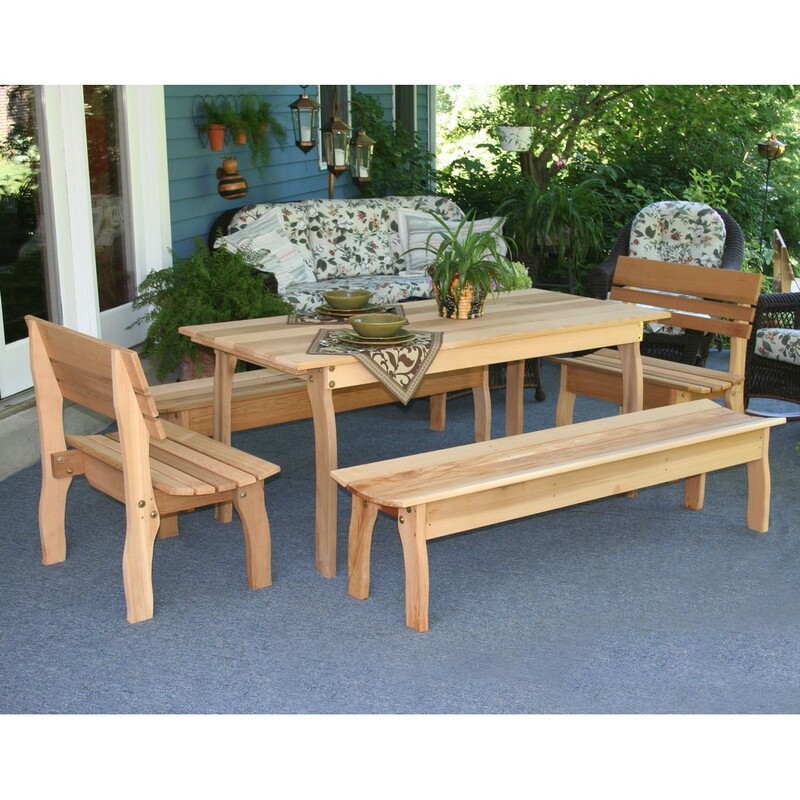 Made in the U.S., this quality set is perfect for large gatherings or big families and includes benches with backs at the head and foot of the table as well as backless benches along the sides. 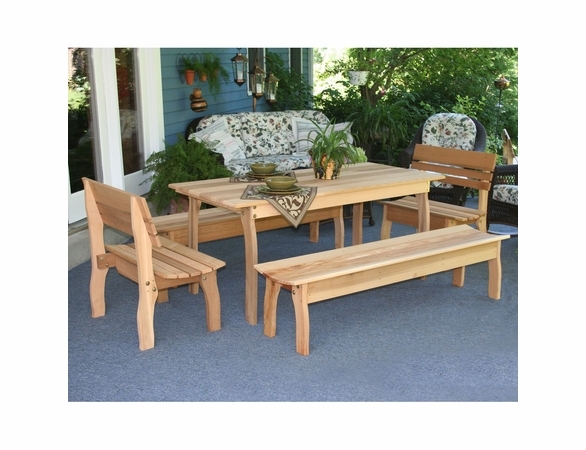 There’s room for all with this quality set made of durable Western red cedar. Features: Made in the U.S.A. This item ships via UPS or FedEx ground transportation. We do not require signatures upon receipt and box(es) will be left where your carrier normally leaves packages. Delivery requests noted in the “additional comments” section during checkout are sometimes honored by the shipper but not guaranteed. The 3rd email from us will be a shipping notification letting you know that your order has “left the building” and at the bottom will be a tracking number and notation if your order was shipped via UPS or FedEx. It’s always best to copy and paste the tracking number into the carrier’s website order tracking area to get up to date detailed information on delivery. Please note that the time it will take for an item to arrive at your door is dependent on where you live. Most items take 1 to 5 business days to arrive after you receive your shipping notice from us. If this item is part of a larger order, it may be consolidated and may ship via Long Haul Truck. Note: The 70" and 94" length sets will ship via Long Haul Trucking Company. Delivery via Truck requires an appointment for the driver to bring your order and will require someone to be there to sign the Bill of Lading. Your 3rd email from us will be a shipping notification letting you know that your order has “left the building”. At the bottom of the notification you will see the name of the trucking company delivering your order and the PRO number which is your tracking number. The phone number that you give us under the shipping information during checkout will be the number the shipping company will call to schedule the delivery. Or if you prefer, you can call the carrier direct to have more control over the delivery time. All you need is your PRO #. Our free shipping includes curbside deliver. If additional shipping services are needed, you can sometimes request that from the carrier when they call or from the driver if they have time. If you’d like to talk over your options, feel free to give us a call and we can share ideas of things other customers have done if they’ve needed help. If your order arrives damaged, please do not refuse it. Please accept your order BUT notate on the Bill of Lading that boxes were damaged. If you feel like it’s bad enough to take a peak before the carrier leaves, you have the right to do so. After opening your order, if there is any concealed damage, please give us a call and we can assist you to rectify the issue. Also, notate this on the Bill of Lading if the driver is still there. Please note that the time it will take for an item to arrive at your door is dependent on where you live. Most items take 2 to 8 business days to arrive after you receive your shipping notice from us. Warranty: 3 Year Limited Warranty on this item! Copyright © 2007- OutdoorFurniturePlus.com. All rights reserved.